So I want to thank all my girls from work (Lisa, Julie, Kristin and Amanda) for a great girls night yesterday. It was a blast! We did Spa Night at the Melting Pot. What's Spa Night? Well it's a incredible deal and a whole lot of fun. 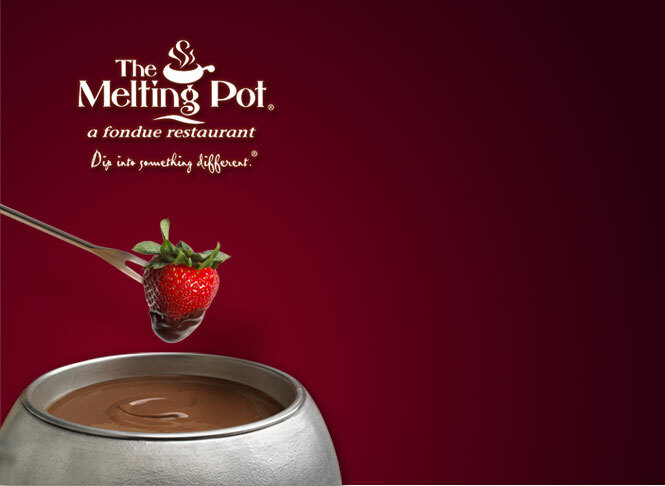 First off if you have never been to the Melting Pot it's a must try. What's better than old school fondue in sleek contemporary surroundings. Cheese, chocolate and cocktails...life doesn't get much better that that! So the Melting Pot at the Fairview Park location which is the one in my stomping ground has Spa Night the last Monday of most months. It really is a fabulous value. For $39 inclusive of tax and tip. There is the Spa Night menu. From this you pick your individual choice of salad and cocktail. Then as a table you choose your cheese (the more people you bring the more choices of cheese you can try...ie a table of 4 gets one pot per table a table of 5 or 6 get 2 pots). The cheese comes with bread, tortilla chips, apples and fresh veggies to dip. Yum! Then you add in mini spa treatments and finish the meal with the tables choice of chocolate fondue with dessert dunkings (like cheese cake, crispy treats, brownies and strawberries). And this is not your average melted chocolate. They have dark, milk and white including mix-ins of things like snickers, marshmallow and caramel. And with this you the perfect ingredients for girls night out! This is how our night went. Our server was Julie. She was great!wonderful!! We started with drinks, cheese and salad orders. I decided on the peach Bellini and California salad (Mixed baby salad greens, Roma tomatoes, candied pecans and Gorgonzola cheese with Raspberry Black Walnut Vinaigrette). Then the cheese choice. We went with Wisconsin Trio Cheese Fondue (Fontina, Butterkäse and buttermilk bleu cheeses with white wine, scallions and a hint of sherry) and Spinach Artichoke Cheese Fondue (Fontina and Butterkäse cheeses, spinach, artichoke hearts and garlic). So we sat and talked and laughed a while. We sipped our tasty cocktails. Enjoyed the fabulously yummy food. Dipping and dunking as we went along. Then after the salad and cheese courses we as a group decided on a chocolate choice. We went with the flaming turtle (milk chocolate, caramel and candied pecans flambéed table side) and the snickers which a great combo of chocolate and peanut butter and snickers. I also decided to add an after dinner coffee cocktail to enjoy with dessert. But wait there's more. Spa treatments!!! Yes while the staff gets your chocolate creations ready, you are swept away for mini spa treatment. Our treatments were provided by the girls at the Brown Aveda Institute of Rocky River. These girls rock! We started with lip exfoliation and gloss followed by hand massages and completed with chair massages. Talk about relaxing. Then bring on the chocolate. As I said we ordered the flaming turtle and snickers. By accident we got s'mores instead of snickers (milk chocolate, marshmallow fluff and graham crackers). But have no fear they quickly brought us a pot of snickers but left the s'mores for us to enjoy as well. How sweet!! The night was topped off with a little gift bag containing hand lotion and bath confetti. How fun! I hated to see the night end. But hopefully we'll have another girls night soon so I can share some more fabulous times with these fantastic girls!